The history of the U.S. Postal Service stretches back to the very beginning of our country (and even a little bit before!). In that 239-year period, there have been some interesting and wacky circumstances that we bet you didn’t learn about in school. 1. Box up my baby, please. Although it has always been strictly against postal regulations, there have been instances where parents “mailed” their children in the early years of Parcel Post. In fact, in 1913, an 8-month-old baby was shipped to his grandmother who lived a few miles away. Weighing just under the 11-pound parcel limit, baby Beagle’s parents paid 15 cents for postage! 2. The King of Rock and Roll … and stamps? The best-selling commemorative stamp to date is the Elvis Stamp that was issued in 1993. Since then, USPS has come out with all kinds of intriguing stamps, including triangular, round and holographic stamps. Before July 1845, people almost never used envelopes. The main issue was cost, because sending two pieces of paper instead of one cost twice as much, since an envelope counted as an extra sheet. Women have served as postmasters since the very beginning of our country’s history. 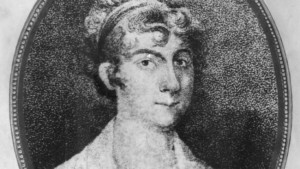 Mary Katherine Goddard was the first women postmaster in the United Colonies (postmaster of Baltimore, Maryland) when Benjamin Franklin was named American Postmaster General in July 1775. The Greenville South Carolina Post Office began using motorcycles (Harley Davidsons, no less!) to deliver mail around 1906. Unfortunately, this changed in 1915, when the Postmaster General declared that motorcycles could only be used for rural delivery if they had affixed weatherproof containers for the mail. 7. Mail Carriers to the rescue! Initiated in 1982, the USPS Carrier Alert Program helps protect the wellbeing of elderly and disabled customers. USPS letter carriers will alert emergency personnel if they notice a buildup of mail or other suspicious circumstances that might indicate an accident or illness. In Alaska, the mail used to be delivered by dogsled. However, in 1963 the last dogsled route (from Gambell to Savoonga) was converted to an airplane route. Dogsleds in Alaska are now used mostly for sport and, of course, for the famous Iditarod Race! 9. Handling all kinds of mail– including email! In addition to all of the physical mail that the USPS handles every year, the Postal Service also has one of the largest corporate email systems. In fact, it receives 3.5 million legitimate emails per day, delivered to more than 208,000 email accounts. 10. Stop, in the name of the USPS! One of the nation’s oldest federal law enforcement agencies is the U.S. Postal Inspection Service. In 2014 alone, the agency reported 6,000 arrests and 5,300 convictions ranging from mail scams, illegal narcotics, counterfeit money orders, fraudulent lottery mailings and more. If you liked those fun facts, find more in USPS’s printable history booklet. To learn more about the USPS, check out our FedEx vs. UPS vs. USPS page.